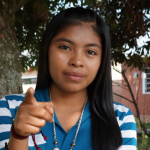 Lisa, a teacher of Early Childhood Education, is originally from Santa Cruz la Laguna, department of Sololá. Lisa was selected as a GOJoven Fellow when she was 19 years old. Lisa is an attentive, supportive, responsible, enthusiastic, committed leader. 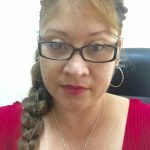 She currently works in the organization Amigos de Santa Cruz, teaching Sexual Education classes to primary to 3rd grade and 5th grade students,. She also gives workshops to parents on prevention of pregnancies in girls. Lisa is a young person who is interested in Sexual Health issues because in her community, there are many maternal deaths and teenage pregnancies, due to lack of information on reproductive sexual health and little access to contraceptive methods. Thus, it is important to strengthen her leadership to be able to help reduce the problems afflicting adolescents and young people.